Schoolhouse Remix: An original song from a San Francisco 3rd Grade class! Check out this original song and music video by third grade teacher Edgar Camago and his students! The San Francisco class composed this song using entirely objects and sounds from within the classroom, highlights including a violin, a white-board eraser and a globe. 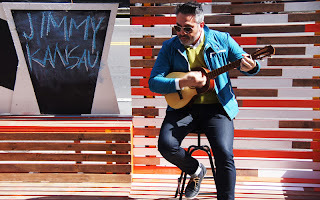 Edgar Camago says that he often combines his passion for music and teaching in the classroom, "I teach using music or even just play the guitar when my students are reading silently." When he decided he wanted to compose a song with his students, Camago was inspired by the remix artists and musicians on YouTube like "Pogo." He wanted to play around with everyday sounds the likes of "Stomp" and other DJ's who sample found noises. To get started, Camago showed his students some remix videos and then had the students brainstorm sounds they could make. As you can see, they got very creative! Over the course of the last month of school, Camago recorded the students in the classroom for a few hours each week. He then crafted the final, rhythmic and creative video. Please enjoy! Any money raised through YouTube will be used towards field trips for the students. Voicebox wins the 2013 American Speech-Language-Hearing Association Media Award! VoiceBox has been selected to receive the 2013 American Speech-Language-Hearing Association (ASHA) Media Award for its broadcasts raising the profile of the human voice. The ASHA Media Award recognizes significant contributions by individuals and organizations for news coverage and media programming that illustrate the impact of communication disorders on quality of life, treatment of communication disorders, programs and services available for individuals with communication disorders, or research in communication sciences and disorders. The achievement will be recognized in an upcoming press release as well as at the 2013 ASHA Convention in Chicago, Illinois this November. Congratulations to Chloe Veltman and the Voicebox team for this amazing achievement! 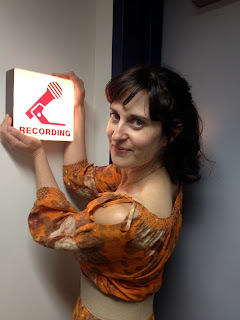 Tune in to Voicebox on Fridays on KALW 91.7 FM San Francisco (10-11pm) or via on-demand webstream at www.kalw.org. 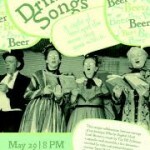 Wednesday evening saw the latest incarnation of Drinking Songs: A Night Of Beer And The Music That Goes With It, an interactive live event that pairs beer tastings with specific songs as a means to tell the story of the close relationship between beer culture and singing culture through the ages. I produced and hosted the event, a collaboration between VoiceBox, my weekly public radio and podcast series about the human voice, and Dogfish Head Craft Brewery, an artisanal beer maker based in Delaware. 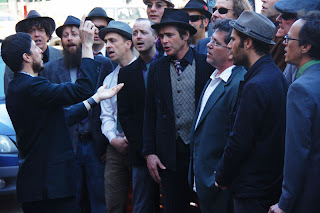 Our singers are an awesome bunch of mostly ex-Chanticleer members who call themselves The Fill-A-Steins for our purposes. And we have a fascinating beer cicerone on hand to talk about the ale end of things -- Sayre Piotrkowski of The St Vincent Tavern in San Francisco. This time around, we had a new partner, Smule, that helped make the event even more interactive. Smule is a Silicon Valley-based company that develops music-making apps like Magic Piano, I Am T-Pain and Ocarina. On Wednesday during intermission, we used a whizzbang app called MadPad to crowdsource a drinking song with anyone who wanted to participate in the packed bar of around 200 people. Smule's Turner Kirk (aka the Mule) went around the room asking for members of the crowd to contribute snippets of song and other sound effects which he captured using the MadPad app on his iPad. MadPad saves nuggets of audio and video which can then be rearranged at the touch of a button into an instant "music video." The product of our tipsy collective imaginations can be seen here. The track includes foot stomping, jangling keys, clinking steins and comely sung phrases like "raise your glass and drink it down" and "beer, beer, beer, beer." 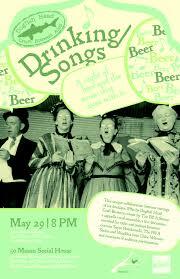 At the start of the second half of our program, we showed off our crowdsourced drinking song on a big screen on stage. The whole thing took about 15 minutes to create from start to finish and it made me (and I think quite a lot of other people who were at 50 Mason Social House on Wednesday night for our event) very, very happy. Finally, here is a 5-minute video capturing the spirit of the entire event. With thanks to Rachel Hamburg, Rebecca Hsu and Jake Wachtel. 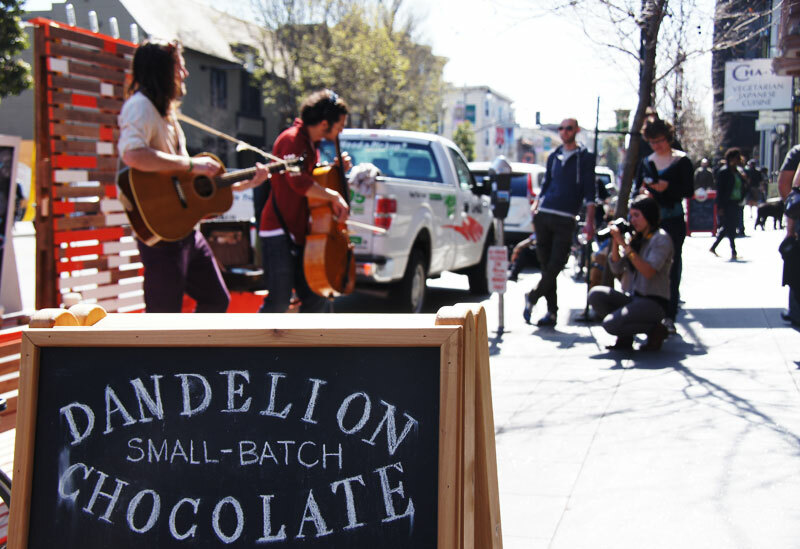 Mission Local, a great local news and culture site, published a feature about VoiceBox's recent collaboration with Street Stage and Dandelion Chocolate. The free chocolate was just a bonus. The main attraction in front of Dandelion Chocolates on the sunny afternoon of March 10 was the live music that beckoned people to stop, lean and listen awhile. 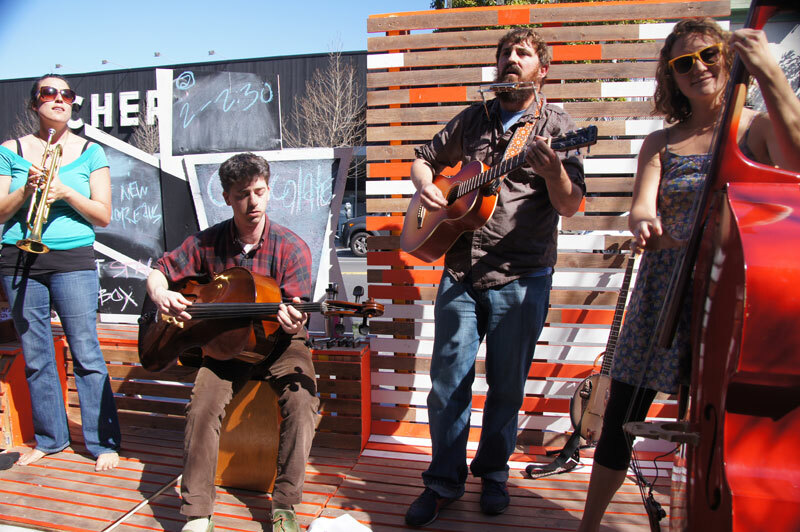 “It’s been going splendidly,” said John M. Francis, co-creator of Street Stage, a mobile parklet dedicated to live performance art. 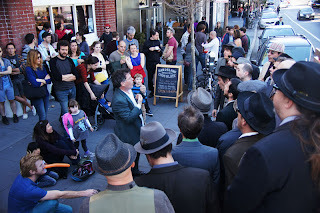 As a band prepared to play on the wooden platform that occupied a parking spot on Valencia Street, he held a glass full of small pieces of dark chocolate that he placed in outstretched hands with a long spoon. 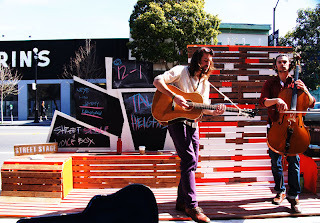 Francis, a city planner and urban designer, and Street Stage collaborator Ross Hansen, a landscape architect and industrial designer, teamed up with the chocolate factory and cafe to support a local business while providing a dedicated space for musicians to play. “This really gives them a presence, a special environment for performing,” said Francis, whose event featured the bands Tall Heights, the New Thoreaus, Conspiracy of Beards, Jimmy Kansau, and Caitlin Lacey & the Twin-Not-Twins. 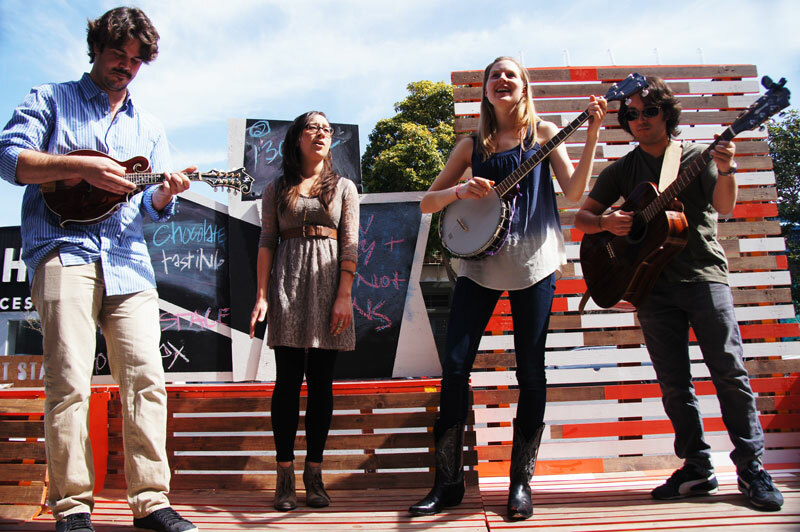 Street Stage was conceived in September 2012 at San Francisco’s first Urban Prototyping Makeathon, hosted by the Gray Area Foundation for the Arts. It has appeared at Off the Grid Fort Mason Holiday Market and Mission Community Market, but this was the first time the pop-up parklet had teamed up with a local business. 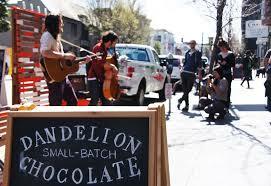 Francis approached Dandelion Chocolates and expressed interest in collaborating on a Sunday afternoon that he knew would draw a lot of people. Dandelion Chocolates loved the idea, and offered to do a free tasting of small-batch chocolates from Venezuela, Madagascar and the Dominican Republic. 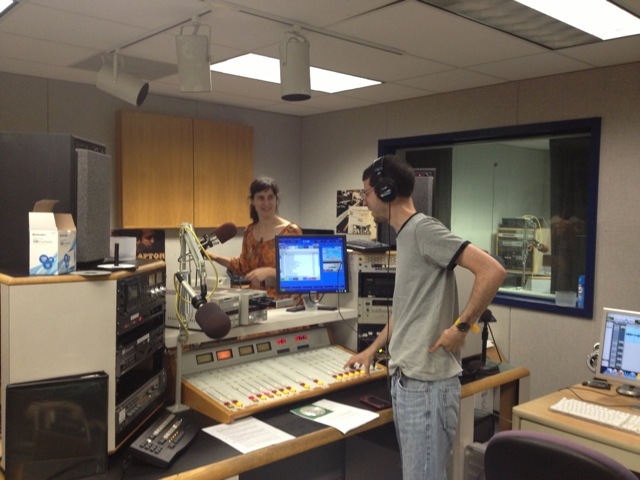 Francis and Hansen organized the event with the help of KALW’s ”VoiceBox,” a weekly public radio and podcast series dedicated to exploring the human voice. VoiceBox staff recorded sounds from the day and invited Francis and Hansen to join them on the air last week to talk about street performance. The elevation of the stage from street level, Francis said, is enough to create a space designated for the community to enjoy live music. 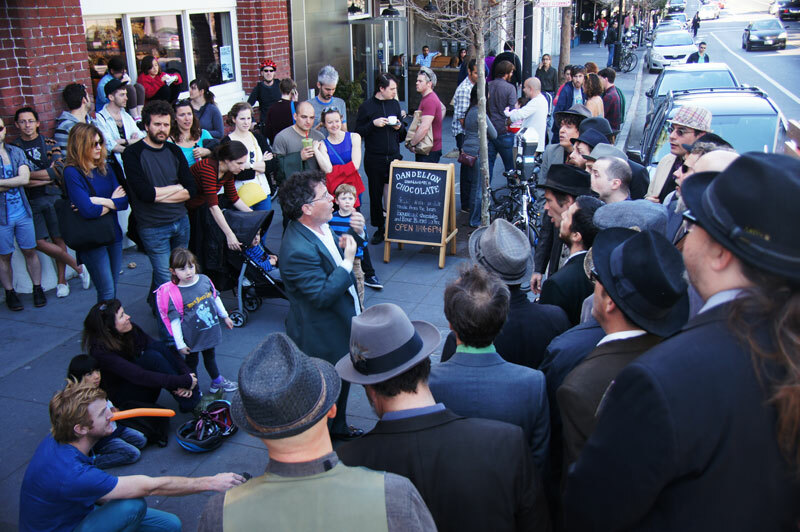 Street Stage becomes a space in front of which people feel comfortable standing and watching. “I like the music,” said Martin Hauser, who was visiting from Germany. He had been walking down Valancia Street when he noticed the large crowd gathered in front of the chocolate shop. He stopped to see what was going on and enjoyed the event so much that he stayed for two performances. In between, Hauser supported the chocolate factory by purchasing chocolate to bring home to friends. Street Stage is just as enjoyable for the performers. Caitlin Lacey, 25, said that her band, Caitlin Lacey & the Twin-Not-Twins, doesn’t perform much. 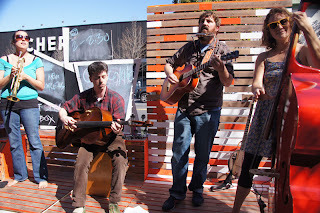 Street Stage gave them the opportunity to play for 30 minutes in front of a large crowd. Lacey is production manager at Dandelion Chocolates, so her involvement with Street Stage was a sweet marriage of work and performance art. “We’d love to play again,” she said. Francis and Hansen hope to bring Street Stage to communities across San Francisco and collaborate with other local businesses, community organizations, markets, public parks and more, to bring people together in active public spaces where they can celebrate art and music. To listen to the “VoiceBox” show that featured Francis and Hansen, click here, go to the “Listen Now” box and click on the “Street Stage” episode. To read the original story, click here. 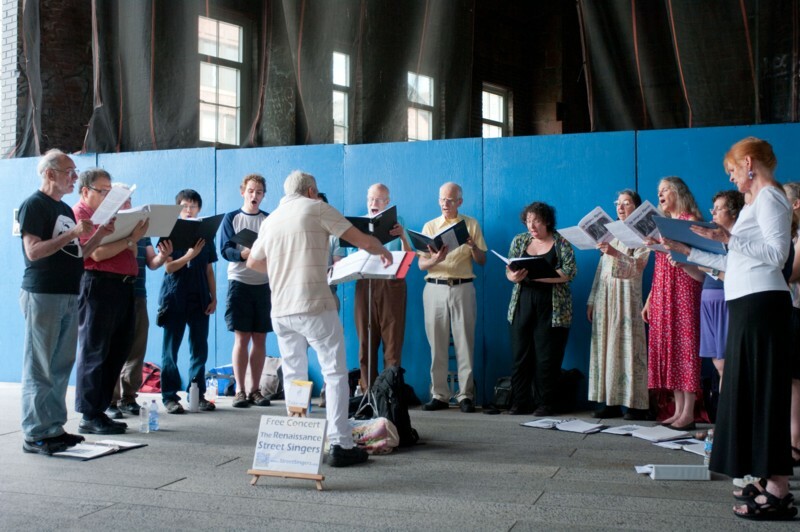 Check out VoiceBox’s upcoming show on the urban singing and performance landscape! Join urban designers John Matthew Francis and Ross Hansen, and Dr Paul Simpson, a human geography lecturer at Keele University UK, as they discuss the dynamic between outdoor performance spaces, vocal performers and audiences. The Renaissance Singers of New York have sung a cappella on the streets since 1973! And not just any a cappella, but hymns, Psalms and other sacred 15th and 16th century music including works by Josquin des Prez (whom you met on Renaissance Man last month). 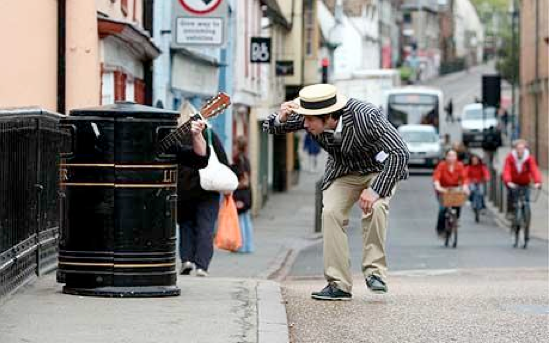 This busker’s claim to fame is that he sings from inside a trash can in Cambridge city center. 30 year old Charlie Cavey is now one of 50 acts in a four-day celebration of street performance in Cambridge. He finds that he always attracts crowds because the people can’t figure out where the music comes from! 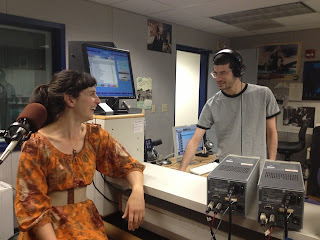 Be sure to listen to VoiceBox on March 29! Urban designers John Matthew Francis and Ross Hansen, the creative forces behind a new kind of mobile stage that can be assembled out of the back of a van in half an hour, and Dr. Paul Simpson, a lecturer in human geography at Keele University, UK, who has studied the urban performance landscape, discuss how giving vocalists a dedicated outdoor performance space is changing the nature of the interactions between street performers, audiences, and the environment. 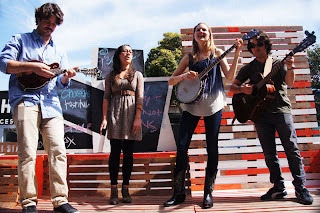 If you want to read more about the Street Stage Pop-Up Parklet event, click here.